A film about how to deal with personal grief and about the issue of historical guilt. Synopsis: June 10, 1944, Distomo: a small farming village on the road leading from Athens to Delphi. This is where little Argyris, who was not even four years old, survived a brutal massacre committed by the German occupying forces. An SS division’s so-called “expiatory measure” after a partisan attack in the vicinity. Within less than two hours, 218 villagers were killed: women, men, elderly people, toddlers, and babies. 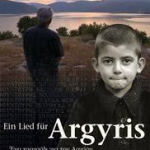 Argyris lost his parents and thirty more relatives. Together with thousands of other war orphans, the boy spent several years in orphanages around Athens. One day a Red Cross delegation appeared selecting a few children to travel to a faraway country. Argyris wanted to go with them at all costs. This is how he went to the Pestalozzi Children’s Village in Trogen/Switzerland. Years later he obtained a Ph.D. in maths and astrophysics at the ETH Zurich. He taught at Zurich grammar schools, translated Greek authors into German and was then active as a development aid worker in Somalia, Nepal and Indonesia, on behalf of the Swiss Disaster Relief Corps. Since returning to Europe, he has been travelling between Switzerland and Greece. His sojourns in his former home country are getting longer. 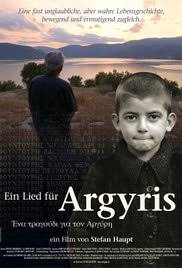 66 year-old Argyris Sfountouris, a man of winning charm and melancholy cheerfulness, has been tackling the horror he was subjected to as a little boy. He organised a “peace congress” where he reflected about ways of escaping the vicious circle of violence. Rather than trying to come to terms with his childhood experience or to get over it emotionally, he has attempted to learn to live with it and to bring something about in the outside world. Nominated for the Schweizer Filmpreis 2007. Winner Audience Award at Thessaloniki Documentary Film Festival, March 2007, and at Los Angeles Greek Film Festival, June 2007.